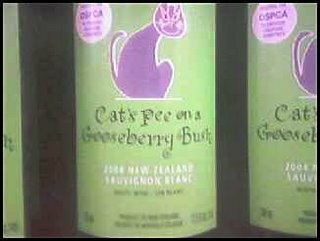 Cat's Pee on a Gooseberry Bush, Sauvignon Blanc Wine from New Zealand. I found this wine on a shelf at a liquor store in Toronto. I was so fascinated by the label that I had to take this picture with my camera phone as I didn't have my Canon PowerShot S500 digital camera with me. Now this is delicious. They probably keep this at room temp to keep the aroma at it's peak.